Go to the "Contacts" tab in your G mail account by clicking on the down-arrow beside "Mail". 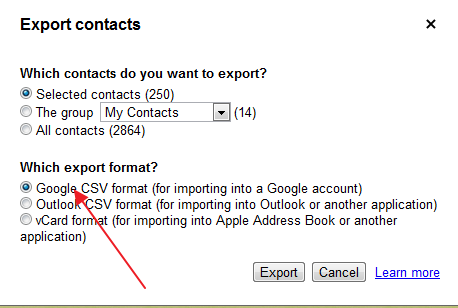 Choose the "Google CSV format" export format option, and click the "Export" button. This will save a file to your computer. Open the file within Microsoft Excel. Since CSV files are supported by Excel, you can click on the file and open it directly with Excel. If however, you come across any problems in opening it, you can solve them by importing the CSV file into Excel, choosing the "Data" tab and then the "From Text" option. Ensure that your Excel sheet has its columns of data organized to match the layout of Electionbuddy's voter list input area.